You may want to quickly check your Amex account to see if you have the following Amex Offer for You. 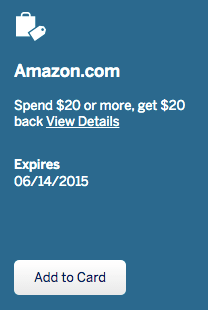 Amex has released a spend $20, get $20 statement credit at Amazon; which is amazing! I hurried over to my Amex account this morning hoping to see this offer available in my account at least once as I am a huge Amazon fan. Unfortunately, I didn’t have it on any of our 4 Amex cards. If you have this offer, lucky you! What a great Amex Offer for You! I would load this to your eligible card right away as this offer will be limited and once enough people load it, it will be gone. You can always purchase Amazon Gift Cards and then load the gift card to your amazon account for future use. nice topic every one should read it.